[G2:1531 n=0 frame=none size=640]In late 2004 five trains, all with former DM&IR locomotives and cars, converge at Proctor. From left to right - arriving ore train from Minntac, arriving empty limestone, Proctor Roadswitch in the distance, departing loaded limestone and a departing empty ore train for United Taconite. Missabe Road, the railroad that many considered the jewel of the Twin Ports, had its beginnings with the discovery of iron ore near Tower, Minnesota in 1864. Twenty years later, in 1884, the Duluth & Iron Range Railroad was completed from Two Harbors to Tower to tap the rich ore reserves that had been discovered there. In the late 1930s U.S. Steel officially consolidated the D&IR with its other line in the area, the Duluth, Missabe & Northern, to form the DM&IR. Big change came to the DM&IR on May 10, 2004 when Canadian National completed its purchase of Great Lakes Transportation (then-owner of the DM&IR). For the purposes of this railfan guide we will handle the former DM&IR territory separately from other area CN operations. 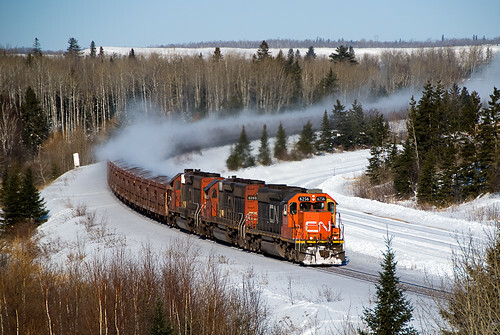 In 2004 CN shipped over 21 million tons of iron ore products, primarily taconite pellets produced by three CN-served plants located on the Mesabi Iron Range. CN is the primary rail connection for the following three taconite plants. What is nice about taconite is that the plants run 24/7/365 so there are no holiday shutdowns. Keep in mind that plants do shutdown for maintenance at least once per year, which impacts production and shipment of pellets. Minntac: U.S. Steel (USX) at Mountain Iron. The largest pellet plant in the United States. Pellets mainly go to the port of Two Harbors (26 miles northeast of Duluth) for shipment by lake vessel to lower lakes ports. There are usually four to five loaded trains per day from the plant. These trains run with 116 cars and two SD40-3s. NOTE: some pellets are sent all-rail through Steelton via BNSF to the USX mills at Granite City, IL (St. Louis), Birmingham, AL (Fairfield), Gary, IN (Gary Works), and Pittsburgh (Edgar Thomson). Ore trains that bypass the docks are generally referred to "all-rail" moves. The Granite City trains use BNSF taconite cars while the trains to Fairfield, ET and Gary generally use steel coal hoppers of various ownership (all trains use BNSF engines). CN also runs a number of all-rail moves south of Superior, depending on the season and new contracts. Minorca: Former Inland Steel at Virginia. 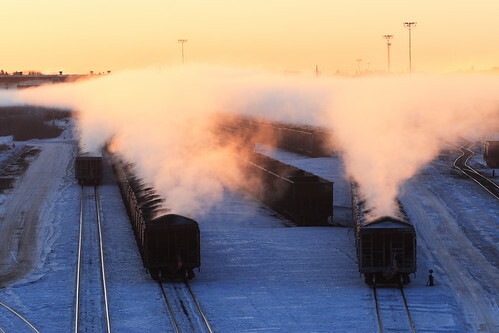 Most pellets go via Two Harbors in a daily 116-car train with a pair of 400s. The plant also sends its winter production by rail to Escanaba, Michigan for stockpiling and movement by ship from there. United Taconite: Former EVTAC plant at Forbes now operated by Cleveland Cliffs with pellets going to the Duluth dock. Usually one to two 140-car trains per 24 hours. There is talk of possibly shifting this traffic through Taconite Harbor in conjunction with Cleveland Cliffs (Cliffs Erie, LLC). Limestone: Minntac and Minorca use limestone in the pellet process. This limestone arrives in the Twin Ports via lake vessel and is loaded into cars at CN's Lakehead Storage Facility located just east of Dock 6. CN then runs the limestone to Proctor Yard where the cars are assembled into trains for the mines. Year-round trains to Minntac use reconditioned former Minntac side-dump cars (painted white) while limestone to Minorca is handled during the summer only using ore cars. General Freight: To handle transfer moves around the Twin Ports CN uses what they call a Proctor Roadswitch. These jobs, usually three per 24 hours, handle all of the former DM&IR ore, limestone, and general freight moves in the Twin Ports. In addition, the MRF (Miscellaneous Road Freight) handles general freight traffic from Proctor to Two Harbors via the Iron Range twice per week (out Monday and Thursday, back Tuesday and Friday). As of early 2005 the diesel house and car shops in Proctor were still open, but at reduced staffing levels, and DM&IR engines and cars continue to be used (due in part to a unique brake system). Some signs have been changed to read CN and DM&IR dispatchers were scheduled to be moved from Keenan to Stevens Point in the spring of 2005. The former DM&IR Interstate/Spirit Lake Branch from South Itasca to Adolph has been absorbed into CN's Superior Subdivision with new mileposts. CN has also shifted southbound manifest trains off the DW&P and onto the DM&IR while continuing to run northbound manifest traffic up the DW&P. One of the more interesting aspects of photographing taconite trains is the fact pellets can steam if the relative humidity is high and it is cool (due to the pellets being baked at 2400F). This steam can add greatly to photographs and is usually most intense just after leaving a plant.